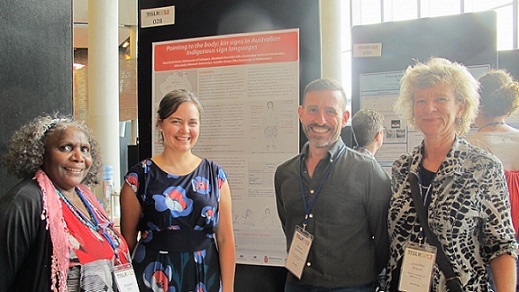 Three Amatyerr signers from Ti Tree community (April Pengart Campbell, Clarrie Kemarr Long and Janie Perrwerl Long) were supported to visit Melbourne to attend the Theoretical Issues in Sign Language Linguistics conference. This is the largest and most important international conference held on sign language research and only happens every 3 years. Less than a quarter of the accepted papers feature in the main program (the rest are posters). The three Ti Tree participants were part of a team (along with RUIL team member Jenny Green) who presented a paper Sign language documentation in a cross-modal contact zone and also a poster presentation comparing kinship signs from the Western Desert, Central Desert, Cape York and Arnhem Land. In the presentation the team examined how a project to create an online dictionary for Central Australian sign languages (http://iltyemiltyem.com) met particular challenges unique to the sociolinguistic context of sign use in Central Australia. They discussed cultural uses of sign, and the use of sign in education in Indigenous communities. This conference presented a great opportunity for Indigenous participants from Central Australia to showcase their work in an International forum, and to network with other Indigenous signers from other parts of Australia and from overseas.